Leafmining flies (leafminers) | Infonet Biovision Home. Ana's notes: It is important to differentiate leafmining flies and leafmining caterpillars, since the management of the two groups of pests is different. The leafminers attacking coffee, cotton, groundnut, soybean and citrus are caterpillars, not leafmining flies. Some work was done on neem for control of leafminers on tomatoes some years back, but it was not published. I am looking for it; it should be added when available. 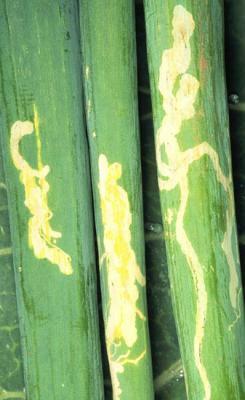 Leafminers may cause damage to green onions. Damage is largely cosmetic, and mining on leaves may cause rejection of marketed onions, but generally does not affect plant growth. Damage in dry onions and garlic is of little concern unless populations become high to prematurely kill foliage. Leafminers are usually controlled by natural enemies, especially parasitic wasps. They can become a problem in areas with a high use of pesticides that kill natural enemies. Leafminers have the ability to develop resistance to pesticides in a short time.